There are many manufacturers now that offer automation of swimming pool equipment. This means that you can now control your pool and other features in your yard via an application on your smartphone or other internet connected devices. One of the manufactures is called Jandy and they offer the iAqualink system. 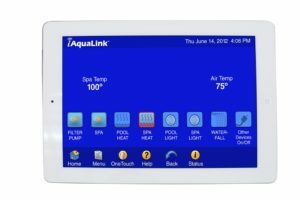 First, your equipment is wired to the Aqualink control box and then the iAqualink connects all the equipment to the internet so it can be controlled from any internet connected device with the application on it. It has many options and you can schedule equipment to come on to a schedule or just on and off as you like. No more going out side trying to figure out what levers to turn and buttons to push just use the application to control your backyard paradise. If you are interested in these features connect with PoolStar for more information. This entry was tagged swimming pool automation, Application for pool control. Bookmark the permalink. ← Simple, Reliable Saltwater Chlorination for swimming pools.